Two new FINAL CRISIS tie-in issues - FINAL CRISIS: REQUIEM and FINAL CRISIS: ROGUES' REVENGE #1 - are going back to press for new, second printings after quick sellouts at DC Comics. FINAL CRISIS: REQUIEM Second Printing (MAY088350) features a recolored version of the issue's cover by Doug Mahnke, and is scheduled to arrive in stores on August 13. FINAL CRISIS: ROGUES' REVENGE #1 Second Printing (MAY088351) features a recolored version of the issue's cover by Scott Kolins, and is scheduled to arrive in stores on August 13. Both these issues have a final order cutoff date of July 24. Retailers may order these items by contacting their Diamond Customer Service Representative or DC Sales Representative, or by email at reorders@diamondcomics.com . - FINAL CRISIS: ROGUES' REVENGE #2 (JUN080184) is on final order cutoff on July 30 and is scheduled to arrive in stores on August 20. - FINAL CRISIS: ROGUES' REVENGE #3 (JUL080109) is solicited in the July Previews and is scheduled to arrive in store on September 17. 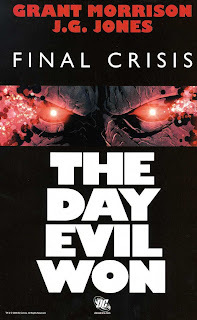 - FINAL CRISIS #1 (MAR080124) is available for reorder. - FINAL CRISIS #2 (APR080166) is available for reorder. - FINAL CRISIS #3 (MAY080145) is available for advance reorder and is scheduled to arrive in stores on August 6. - FINAL CRISIS #1: DIRECTOR'S CUT SPECIAL (JUN080183) is available for advance reorder and is scheduled to arrive in stores on August 6. - FINAL CRISIS #4 (JUL080107) is solicited in the July Previews and is scheduled to arrive in stores on September 17. - FINAL CRISIS: REVELATIONS #1 (JUN080179) is on final order cutoff on July 24 and is scheduled to arrive in stores on August 13. - FINAL CRISIS: REVELATIONS #2 (JUL080108) is solicited in the July Previews and is scheduled to arrive in stores on September 10. - FINAL CRISIS: LEGION OF THREE WORLDS #1 (JUN080180) is on final order cutoff on July 31 and is scheduled to arrive in stores on August 20. - FINAL CRISIS: LEGION OF THREE WORLDS #2 (JUL080110) is solicited in the July Previews and is scheduled to arrive in stores on September 17.